Jeanne d'Arc is immortalized in countless mural, sculptures, and writings around the world. Here in Quebec City, this iconic girl also known as Joan of Arc has her very own park. 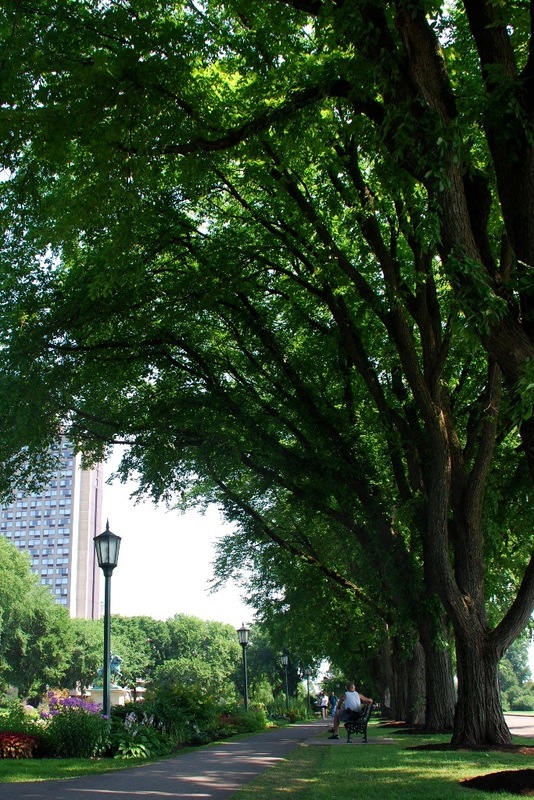 In keeping with the city's fascination with battles, and tradition of transforming old battlefields into public leisure areas, Joan of Arc's park is across the street from the embattled Plaines of Abraham. During the 36th Worldwide SketchCrawl, a group of local sketchers gathered here for Quebec City's first ever. I will admit, I could not fully tell you Joan's story, though I probably learned it in elementary school. I wonder if any of the others, mostly Québeçois(e), could fill in the blanks. 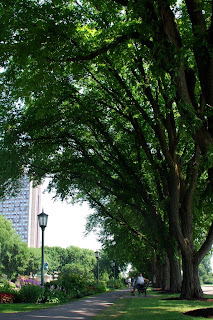 Rather than re-writing Joan's history that morning, my imagination was captured by the boulevard of towering oak trees which serves as a spinal column between the two parks. The weather was fine in the antiquated sense of the word - sunny, nary a puff of a breeze, a nap-inducing warmth and humidity. The sculpted classical French garden, with its border of lush flowers was overshadowed by the oaks, thus sheltered from the sun bearing down on the Plaines only a few meters away. 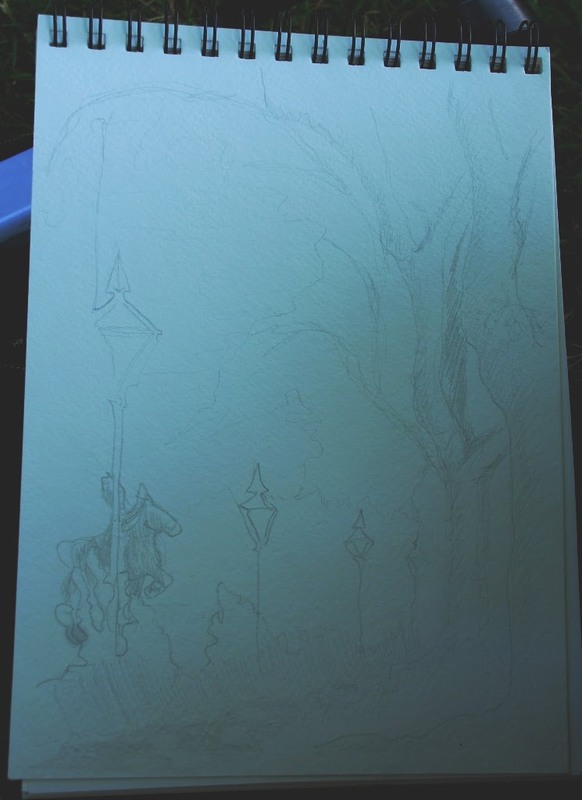 In the end, my sketch reflects well the tranquility of the morning, though it does not actually provide much sense of the wall of majestic oaks. I also tried out a technique I've recently noticed other landscape artists using - selective color, to emphasize the key aspect of a subject. And, I did my very best not to over-do it when inking and details. Drawn to Québec post about the SketchCrawl, with sketches and photos from all the participants (will be posted 19 July). Arc in the lower left (center of the park). is difficult to tell from this angle. paper is to use it, so I keep adding color. cloak of shade cast by the venerable oaks.